El Presidente returns in another Caribbean paradise-turned-city-builder, Tropico 6. Moving from the colonial era to modern times, Tropico’s familiar formula asks you to construct a city, manage its citizens and keep them happy, and make political decisions that directly impact gameplay, all to the tune of its signature Latin soundtrack and colorful backdrop. While Tropico 6 has beautiful visuals and witty storytelling, it doesn’t feel much different than the previous Tropico games. To watch our full video review of Tropico 6, click play on the video below. Tropico 6 introduces the archipelago system, offering players the chance to build on a whole system of islands rather than one large rock. It also brings a number of quality of life improvements to the previous formula, including better road mechanics, streamlined trading routes and more effective happiness overlays. 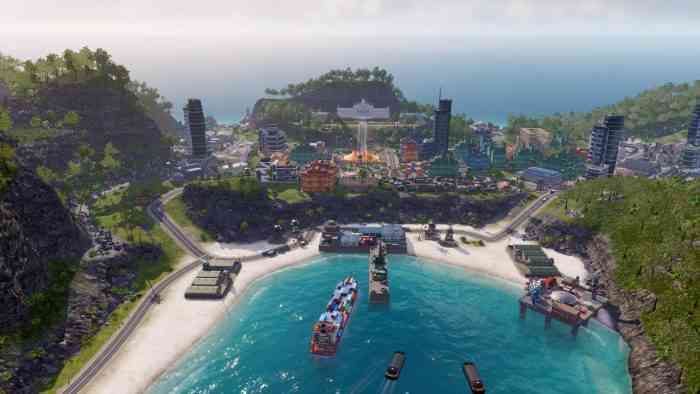 The major flaw of Tropico 6 is that it is essentially a gussied-up version of Tropico 5, despite having a few new features such as the ability to give speeches as El Presidente and the addition of a couple new government buildings. The visuals are gorgeous and the dialogue keeps the tone upbeat and hilarious even in the most catastrophic circumstances, but it doesn’t feel like an entirely new game. Still, its a dynamic city-builder that asks players to manage and consider many more factors than just zoning, and there’s never been a better excuse to take a trip to the Caribbean. What do you think of the game? Have you played it yet? Let us know on Facebook, Twitter, or the Comments section below!